This is 10,000 years earlier than previously understood for the interior deserts of Australia, and among some of the earliest known evidence for people living in deserts anywhere in the world. The remote Carnarvon Ranges are near the Canning Stock Route. 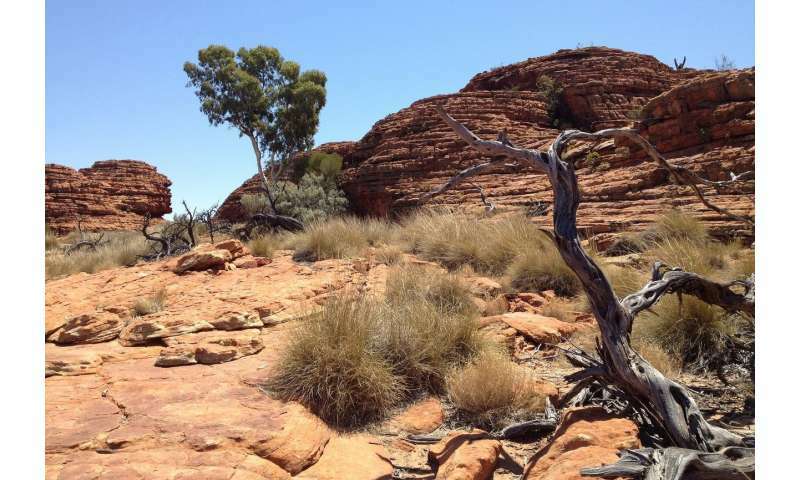 Evidence from the Karnatukul site (previously known as Serpents Glen) indicates that people lived in this interior desert from very early in the settlement of Australia and that they remained in these ranges during the last Ice Age. Lead Investigator Professor Jo McDonald, Director of UWA's Centre for Rock Art Research and Management, said a significant find supported that this early group of desert peoples were technological innovators. "We found in deposits dating back around 43,000 years ago an early backed microlith, a hafted multifunctional tool which could be used as either a spear barb or for wood-working," Professor McDonald said. "This is more than 15,000 years earlier than other known Australian examples of this tool type. Residue found on the tool indicates that hafting technology was practised much earlier than had been previously demonstrated in Australia. Tools such as this are found across most of southern and eastern Australia, but most are dated to the last 4,000 years." Professor McDonald said the findings supported the notion that the first Australians adapted with ingenuity and flexibility as they dispersed into every bioregion of Australia within ten millennia after arriving on this continent. "The fact that we have also been able to demonstrate a range of symbolic behaviours in the last 1,000 years – with rock art production and extraordinarily high levels of site use at this same time – demonstrates the continuity and complexity of long-term connections by Australian desert peoples," she said. Co-Investigator Professor Peter Veth, UWA Kimberley Foundation Ian Potter Chair in Rock Art Archaeology, said the finding represented a revolution in understanding the adaptive and technological sophistication of early Aboriginal peoples living in the interior deserts of Australia. "It's enthralling to see scientific and Aboriginal narratives working together to create an extraordinary new canvas for the vast desert landscapes of the Australian imagination," Professor Veth said. Professor McDonald said the Birriliburru IPA is an area of exclusive possession native title determination area held in trust by Mungarlu Ngurrarankatja Rirraunkaja Aboriginal Corporation. The Carnarvon Ranges remain closed to unaccompanied tourist visitation. The Birriliburru Rangers actively patrol and conduct land management activities in the area to protect the cultural and conservation values.